On November 10, 2018, PADEP published a notice in the Pennsylvania Bulletin announcing its intention to make substantive revisions to its Management of Fill Policy. The Management of Fill Policy serves a critically important role in distinguishing between fill material that is regulated as a waste under Pennsylvania’s Solid Waste Management Act ("regulated fill") and material that can be handled and used outside the purview of the waste regulations ("clean fill"). Comments were due by January 8, 2019 and PADEP will be considering these comments before finalizing the revisions, probably some time later in 2019. The proposed revisions to the Management of Fill Policy include significant modifications to the current standards and procedures for determining whether fill material is clean fill or regulated fill. 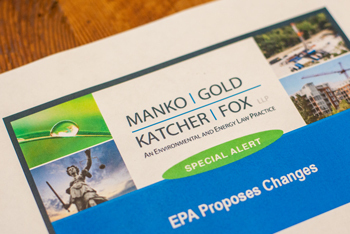 The proposed changes will have broad impacts within the regulated community, affecting, among others, state and local governmental entities, real estate developers, land owners, landfills, utilities, roads, railroads, port operators, and excavation contractors. Activities and projects involving earth disturbance and excavation work including Brownfields projects, development projects, infrastructure projects and utility projects will be significantly impacted by the proposal. Indeed, it is hard to imagine a more important or far-reaching guidance document that PADEP has developed. Our firm has been closely following PADEP's efforts to modernize this policy, which has not been substantially updated since 2004. We have prepared and submitted comments on behalf of many of our clients across a broad range of industries and will continue to track PADEP’s progress in this important effort.